If you've ever made French bread at home, you've made pizza dough. Traditional, DOC (Denominazione de Origine Controllata) designated pizza dough from Italy contains nothing but flour, salt, water, and yeast. The dough at most neighborhood pizza joints contains a few more ingredients. Fats are added to make the dough more supple, and sugars are added to feed the yeast and give the bread a touch of sweetness. 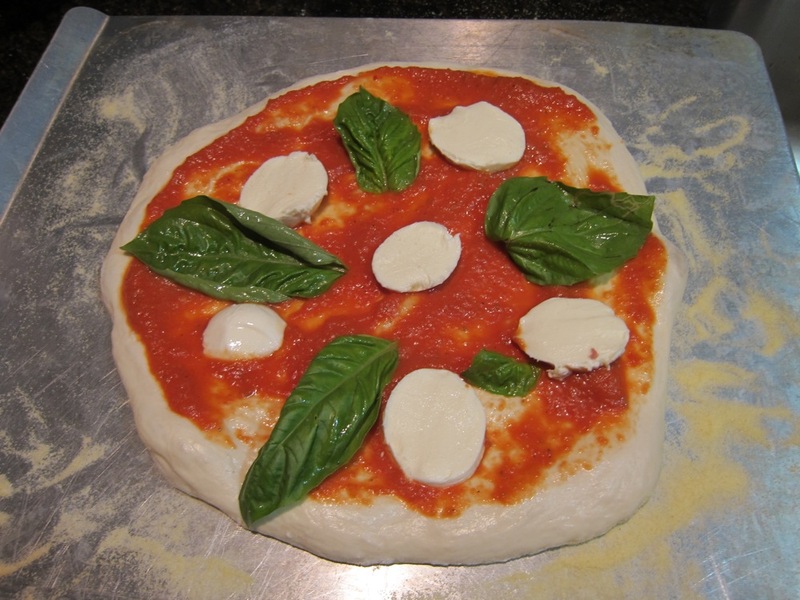 I suggest that home bakers begin with a simple, versatile pizza dough recipe like the one below. Once you've got that under control you can experiment to find something more to your liking. Realize that you are going to give your pizza a lot more TLC than the employees at most chain pizza places do. If teenagers working at Dominos for 6 bucks an hour can make a decent pizza, you shouldn't have any problem doing it yourself at home! This is the Neo-Neapolitan Pizza Dough from Peter Reinhart's American Pie. It is a low-yeast, slow-rising dough with enough suppleness to make it easy to work with. I find it to be the most versatile dough recipe I've come across. Divide the dough into 4 pieces. Place each one into an oiled freezer bag. I just squirt a couple of sprays of spray oil into the bag. You can also brush the outside of the dough with olive oil and then place it into the bag. All that matters is that you be able to get the dough out of the bag later. If you aren't going to bake them that day, you can throw the bags into the freezer. They'll stay good in there for at least a month. The evening before you intend to bake them, move the frozen dough balls to the refrigerator to thaw. If you intend to bake them later that day, place the bagged dough balls in the refrigerator. Remove them from the fridge and let them warm to room temperature an hour or two before you intend to bake them. Remember that, as a baker, time is your friend: longer, slower rises at reduced temperature result in better tasting bread. But sometimes you don't have the luxury of time - that is OK; this dough will still work well if only given an hour or so to rise at room temperature. Allowing pizza dough to rise is more about giving the yeast time to bring flavors out of the wheat than it is about leavening. Most of the leavening occurs when you put the active dough into the hot oven, so you don't need to wait until the dough balls double in size. Surely you can prepare the dough an hour before baking, can't you? That'll give you time to make the sauce, grate the cheese, and get the oven hot. Speaking of which, it is time to put together a sauce. Once again, there are a million different pizza sauces. If you already have one you like, feel free to stick with it. Or consider doing something totally different, like using pesto or barbecue sauce instead of a tomato sauce. I throw this recipe out because it takes under 3 minutes to make and is quite good. Once again, it is from Peter Reinhart's pizza book. Stir everything together. If the tomatoes are too chunky, break them up with your fingers. Fresh tomatoes or herbs can be substituted for canned tomatoes and dried herbs. The fresh tomatoes don't even need to be cooked first, since the time in the oven baking is enough to cook them. I am not experienced enough to do the whole "throw the pizza into the air" thing. My technique for shaping the dough is extremely simple. I pick up a ball of dough and gentle stretch it into a circle. Once I've got a circle four or five inches across, I hold it up by the edge and, while rotating it, let the weight of the rest of the dough pull it down to stretch it out. When I start feeling resistance in the dough, I set it down on a lightly greased plate to rest for 5 or 10 minutes. Then I pick it up again and stretch it a little thinner before lying it down to add the toppings. I like to stretch my dough quite thin, until it is almost transparent. If you like thicker pizza dough then, obviously, don't stretch it out so much. You can use rolling pin to shape the dough. Doing so results in a more uniform dough with numerous small holes. I personally like the dough to be thinner in the center than the edge and to have a thicker, bready crown full of large irregular holes around the outside. This effect is difficult to achieve with rolling pin, but if that suits your taste then go for it. 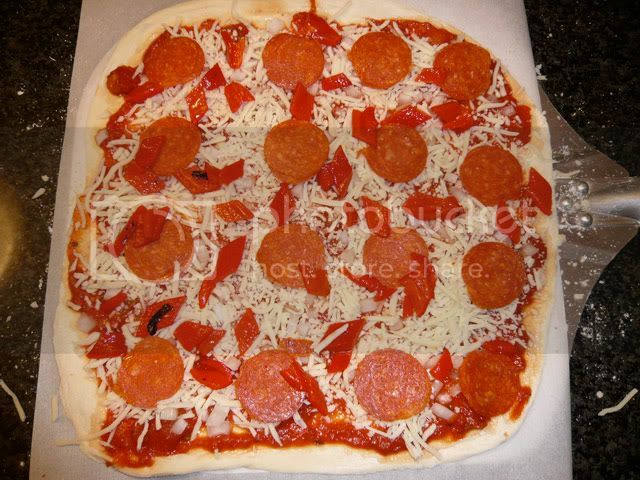 Before you put the toppings on the dough, you need to know on what surface you intend to bake the pizza. If you have a pizza stone, it should be put in the oven and getting hot (450 or 500 degrees) by now. If not, the back of a cookie sheet works fine. 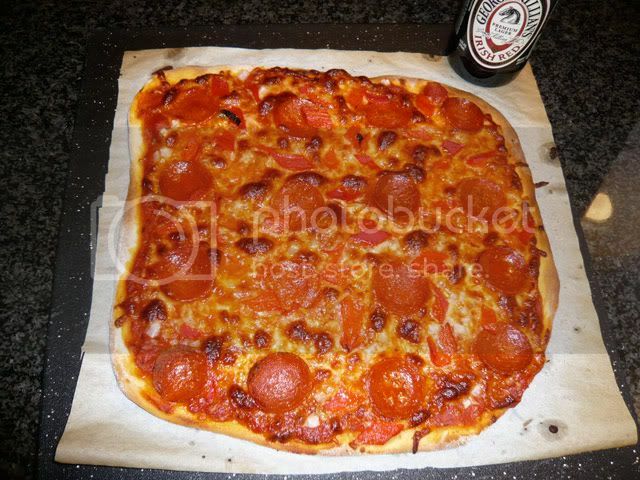 If you are going to try transferring your pizza from one surface (like a peel or a cookie sheet) to another (like a hot pizza stone), I strongly recommend using parchment paper under the pizza. Particularly if you are going to add a lot of toppings to the pie: the extra weight pressing down tends to make the dough stick to the surface you dressed it on. You could also try to sprinkle corn meal or semolina flour on the surface hoping that will be enough to let you slide the dough without sticking - in my experience, though, it rarely is; I've had many pizzas end up looking like roadkill because they wouldn't to come off the peel smoothly. I've cut the number of swear words I use in the kitchen in half just by springing for a 5 dollar roll of baking parchment and placing a piece of it under the pizza. 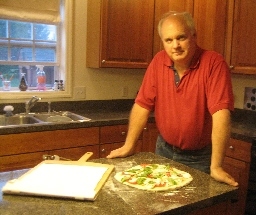 I just grab a corner of the paper and tug it into place when it is time to slide the pizza into the oven. Much, much simpler. Whatever surface you decide to dress the pizza on, sprinkle it with corn meal or semolina flour and spread the dough over it. Add the sauce, the grated cheese (typically mozarella and parmesan, but there is no reason you can't improvise), and toppings. As I mentioned earlier, most of the rise you get from pizza dough actually happens in the oven. Professional pizza ovens are much hotter than home ovens. At home you typically want to make pizza at the highest temperature that your oven can safely handle, like 450 or 500 degrees. 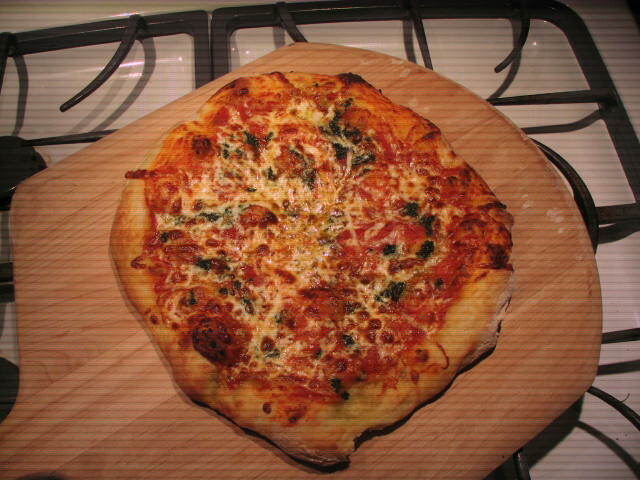 Baking on a pizza stone will give your dough a little more pop when it gets in the oven but it is not necessary to make good pizza. If not the lowest shelf, then the second to lowest is probably the best place to bake your pie. You want the pizza to be as close to the heat source as is possible without burning. But every oven is different, so adjust accordly. Place the pizza in the hot oven, close the door, and let it bake for 5 minutes. Check it every minute or two until the cheese is melted and the dough looks baked. In my oven with the size pizzas I make, I bake them for 7 to 9 minutes. Pull them out, slice them, and eat! 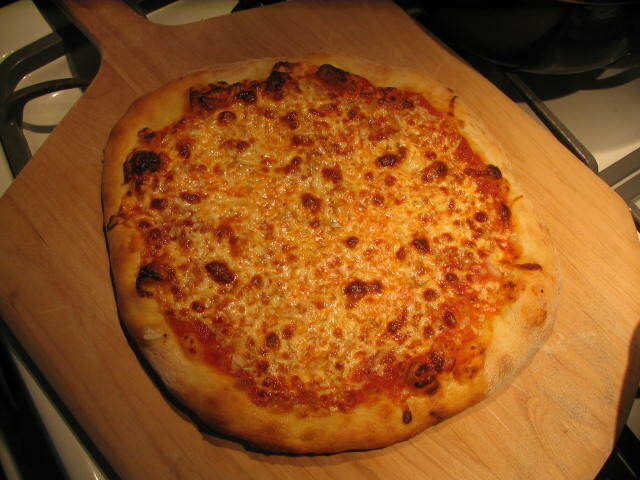 As I mentioned, there are dozens of dough recipes for the endless different styles of pizza. The most traditional recipe includes nothing but flour, yeast, salt, and water. Adding a little bit of oil makes the dough more supple so that it can be stretched easier and is softer to the bite. Adding a touch of sugar gives the yeast something to snack on. And more yeast can be added to guarantee a rise even for heavily topped pies. Thin and Crackery - Add less (or no) oil. Try using some high protein bread flour, like one out of five of the cups. Stretch the dough extremely thin. Bake it on a pizza stone or as close to the heat source as possible without burning it. Thick and Chewy - Substitute milk for half of the water. Add more oil or shortening to the dough. Increase the sugar and the yeast by half again. Don't roll the dough out so thin. Bake it up a shelf or two in the oven so that it can bake longer without burning. Any of the other techniques you've learned for baking bread can be adapted for pizza: sourdough, the sponge method, including whole wheat flour, even grilling, which I will write about when the weather warms up. So use your imagination! If other folks have dough recipes they've had good experience with, I'd love to have them share them below. Please specify what style dough it makes. WOW...your pizza looks if it was baked in a brick oven 8-). . Actually i was planing to buy this book ;-) plus a pizza stone and peel. 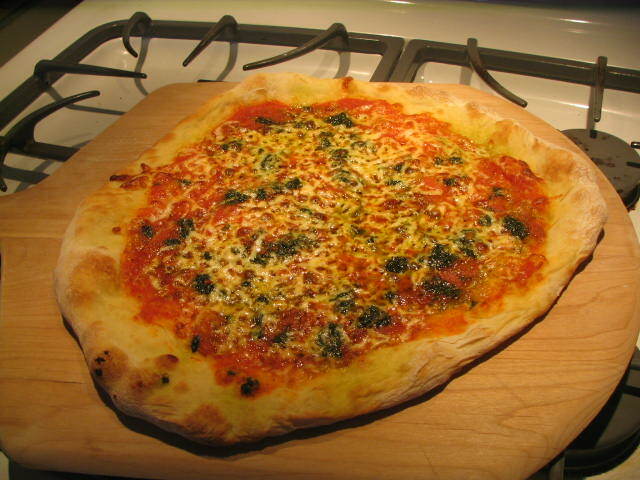 i`ve tried a recipe from the ITALIAN BAKER and a recipe from FINE COOKING magazine(using pizza pans with holes) ... I`m searching for the best pizza dough. I can hardly wait to try this delicious recipe. 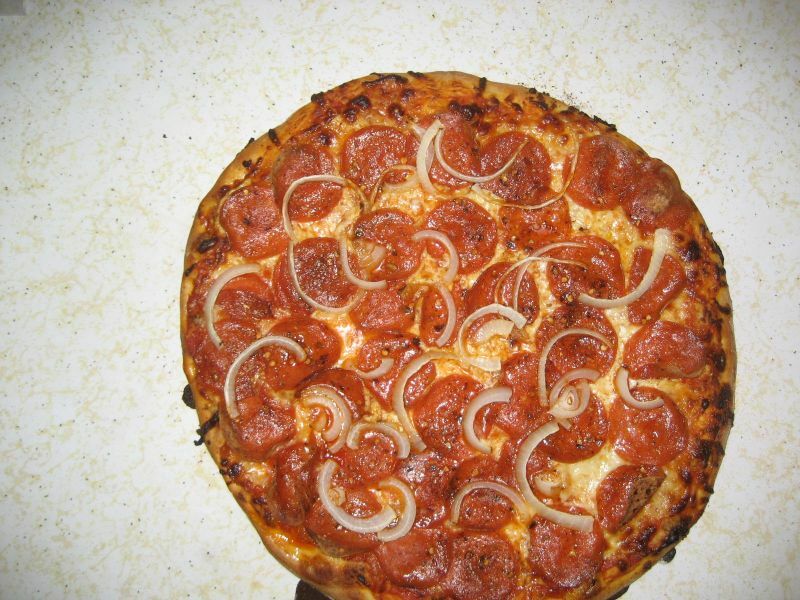 Did you use a pizza stone and a peel to bake this pizza?? TIP: I once read if you want the look of a resturant pizza, brush the edges of your pizza with olive oil when you pull it out from the oven. I did, but as I said, I've had really good luck in the past just using the back of a cookie sheet. Glad to hear it turned out well. Yeah, sticky dough takes practice to handle. 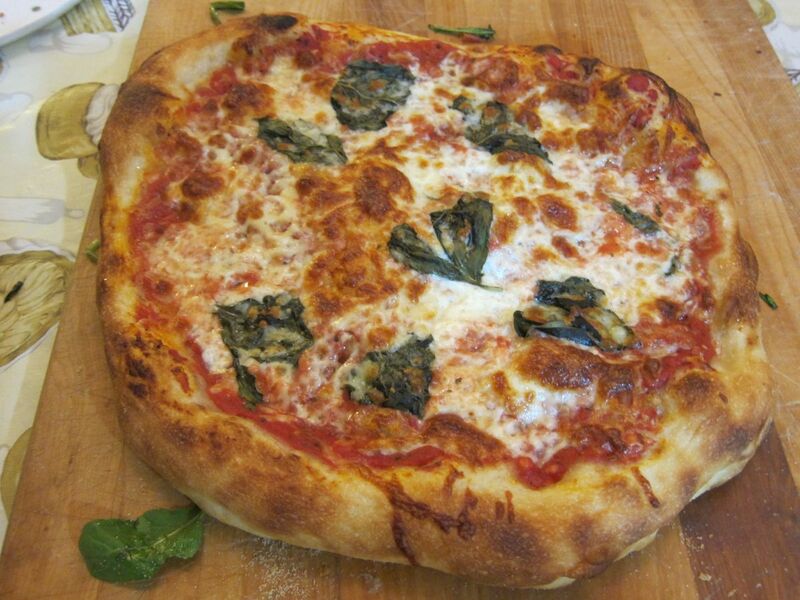 A little flour on your hands can help, or a little extra olive oil on the outside of the dough. You can make it drier but you really want it to be as wet as you can handle so that it'll stretch real easily. i generally use a local (southern california) wild-yeast starter that i built and make about a 65% water/breadflour dough, with about 2% salt. Per Peter Reinhart, I also bag my dough, but let it slow ferment overnight in the fridge before I freeze it. With that long ferment, I get gorgeous gluten chains,which lets me make my crusts ultra-thin. Lately, I've also been playing with a softer thicker crust, more like Sicilian ... add 5% olive oil and reduce the water accordingly. Incidentally, I discovered that a generous dusting of semolina is usually more than enough to prevent sticking on the peel ... and I make sure the dough is free by wiggling it on the peel before I dress it. I bake mine on one of those great made in Taiwan rectangular stones at 550 for 7-9 minutes, depending on the thickness of the crust. Hi Elagins - this is really going back in time. Where did you get your Taiwan pizza stones? What brand is it? I recently purchased Peter Reinhart's Bread Baker's Apprentice and American Pie. I must say the crust and sauces are wonderful. Little work and tons of flavor. As for baking on stones, I've filled my little electric oven with unglazed quarry tile. It seems to do wonderfully in creating an extra crispy crust. And the best part, it only cost me $17 to get enough tile to create a 1" thinkness on top and bottom. I usually do 1" on the bottom and 1/2" on top though, saving the extra six for when I inevitably break one. Here my question, has anyone used the Super Peel? (www.superpeel.com) I'm seriously thinking about purchasing one. I can work with semolina/cornmeal just fine but would like something a little easier if possible. I use a Super Peel for my bread baking and consider it to be among my most valuable baking tools. I think of it as a mini oven loader for the home baker. I saw your post and wanted to ask about the super peel. This is the first time I'd ever heard of it and wonder why its so spectacular. I recently received a peel (14x16) metal sheet with wood handle. It seems to work fine for me. Very similar to what was used at a pizza restaurant I worked at some years ago and baked hundreds of pizzas and hot sandwiches using this kind of peel without any problems. But when I use the peel, I use parchment paper rather than cornmeal for a smoother transport to the oven. I think this peel I received only cost about $20 through Amazon. So it brings me back to my question of... What makes the pizza peel so much better? (and I'm not trying to sound disrespectful or anything.) I'm just curious. I'm new to baking. 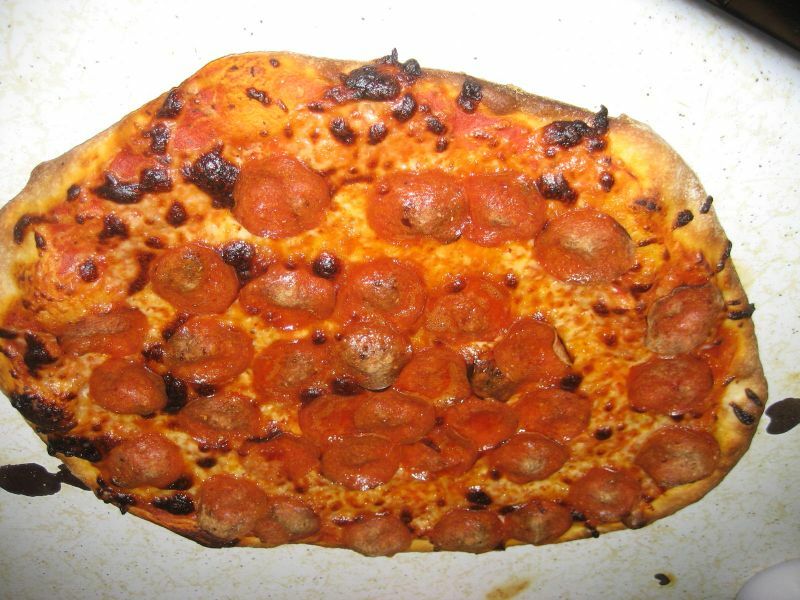 Maybe the answer is clear, but when you use parchment paper under your pizza when the pizza is on the peel, do you remove the parchment paper when you put the pizza in the oven? Do you just pull it out or do you leave it in? Thanks! Depending how hot your oven is will tell you when to remove the parch. Example; 550F, remove parch after 99 sec, that's my way. Otherwise when the parch gets very dark/brown lift pie with large spatula and pull out parch. Superpeel cool tool created by a guy that calls himself Gaspar AKA Pizza Meister. Too expensive to consider so been far from USA shiping costs will kill me. You are correct about the shipping. Just sent one to Australia and shipping alone was 36.90. But, I have shipped all over the globe. I have a work-around which can make this product available to anyone/anywhere for only a very small surcharge over the advertized price. If you are interested, you can contact me for details. I made this dough earlier in the week and froze it. We ended up eating some last night and the taste was great, but one problem I had was that the dough wasn't elastic enough. Just picking it up caused it to stretch paper thin and the pizza ended up more like a roman pizza than one that has a thicker crust. Is this normal for this dough? What would be the best way to make the crust a little thicker and chewier without altering the flavor to much? It was almost impossible not to get the dough paper thin. Floydm-dinner was to be seared tuna and a salad...we now have pizza dough in the fridge...I blame the picture!! Too good to pass by. I'm really enjoying the site! I'd been searching all over for instructions for using the sponge method since watching Aston Brown bake on a pizza stone, and I'm find the recipes here are inspiring. As you can see from the first pic, the focus of the pizza is the crust, and it's quite filling. At the bottom of the page is a recipe for yeastless crust with buttermilk, which is handy when you have less time and also makes a thinner, crisper alternative. Let me know how it turns out if you decide to try it! I've just found a great book on peppers written by a publisher: <i>The Pepper Harvest Cookebook<i> by Barbara Ciletti. It includes a Marinara Pizza Sauce which I haven't yet tried, but intend to. Combine ingredients in large saucepan and simmer over medium-low heat 35-45 minutes, or until bubbly. Stir to prevent sticking. When mixture reaches desired thickness, pour into hot, sterilized jars leaving 1/4 inch headspace. Screw lids and rings tightly and process 20 minutes in boiling-water bath. I think I'd be inclined to use the tiny jam jars so I wouldn't have left-overs from one or two pizzas, but at least the hot chili will discourage mold growth if kept in the frige. I'd also like to try roasted jalapenos and pure with a hand blender toward the end. I made this tonight instead of finishing up the corned beef and cabbage. My wife and daughter loved it and the crust was perfect. I used 1 cup of King Arthur Italian style flour and 4 cups of AP as called for. The other thing I did outside of the recipe is before I top the pie, I bake the shell for about 3 minutes completely clean. It started to raise like focaccia but even with multiple toppings it didn't get soggy on the bottom center. My wife paid me the ultimate complement when she said "you made it look so easy". Which of course it was. Our last attempt was more entertaining since the dough was more like rubber. This was nice and smooth and easy to work with. Thanks Floyd for all you do! Hi Floyd! Just wanted to report that the pizza turned out the best yet! It was exceptional from my perspective. So the technique part helped and the PR recipe was terrific! I think I need to make a tweek to the sauce because my canned tomatoes were pretty watery. If I used Del Monte again, I will probably drain them first before squishing them (I used the diced tomatoes) so they were a little wet. But the flavor of the crust was awesome. Crisp on the outside and tender on the inside. By the time I baked the second pizza, the dough was so supple. I'm learning that term should really be extensible. Thanks again for this step by step guide, Floyd! I try to avoid developing brand loyalties, but I have to admit, the best and most consistent pizza sauce that I have made so far has been with 6 in 1 brand tomatoes. Of course some sort of labor intensive, home-grown, organic something or other would be better. However, I have found that a can of 6 in 1, with all your favorite herbs in a one quart mason jar with lid makes a very good sauce in just minutes. Nothing extra to clean, not much of anything to prep. You don't even need a spoon! Just put in all the ingredients, tighten the lid and shake. In fact, if you make the sauce ahead of time, you can use dried herbs and allow the sauce to mellow and mix, and the sauce will actually be nice and deep with plenty of flavor. That makes it about a 2 minute sauce! And it is already in a jar, so if you don't use it all, you can just pop it right in the fridge. Has anyone cooked P. Reinhart's dough (thanks Floyd for the recipe) on a grill? Do you just do the standard cook one side, flip, cover in olive oil, toppings, place back on grill? PS, made the dough on the Cooks Illustrated homepage. If you don't have an account, it's a free link at the moment. Approx 90 min rise time. Taste was great, but my pizza dough spreading skills could use some work. The sticky dough was hard to roll, so the hand method worked ok - just not round. Artisan Pizza? I'd love to hear feedback on this. Grilled pizza's one of my projects for the summer. I'm taking a cooking class next month that's featuring grilled pizza so it should be interesting to compare. One lesson is that wetter doughs are probably pressed/worked better OFF the peel..had some sticking on the peel after I put pressure on the dough. Oh.. don't forget to place the toppins on the 1st cooked side! Made that mistake once. One side gets VERY cooked if you don't. Fewer toppings seems to work better given the relatively quick cooking time. I am experimenting with adding wood chips to increase the smoke flavor. What a great summertime project! I tried pizza on the grill once ... used my standard very slack pizza dough 65% water, 10% olive oil, 2% salt, 1% active dry yeast and Costco (ConAgra) bread flour (~13% protein). Basically, I put my stone onto the grill used the Weber gas grill to replicate my oven -- heat from the bottom, covered, with temp about 525-550 according to the built-in thermometer. I gave the stone a good long preheat and found that the pizza wasn't much different from what comes out of my electric oven (I bake my pizza at 550). Maybe a bit smokier and slightly crisper crust because of higher temp, but I can't be certain. All in all, not very different. That's what I thought would happen with pizza on a gas or electric grill. I'm sure a woodfired grill would make all the difference. If grilling for company and eating outside I can see the fun of making some pizzas on the grill but otherwise the oven is just as easy or easier. But then I don't know much about grilling so I may be missing something. When I do pizza on the grill, I just skip the stone and grill right on the grate. With or without wood chips, it turns out nice and smoky flavored. Mmmmm, smoking chips. What a great idea. Lately I haven't even been soaking the chips in water for short cooking foods. I just throw a small handfull on the back grate. If they are too small, they will fall through the grate. I've been studying pizza making for about 6 months and after a lot of trials and recieving great advice, I learned a few tricks that may be helpful to you. With these tips, I finally made what I felt was a true NY pizza. I buy my cheese from a local pizzeria. It is a brand called Grande. They sell it to me already grated for $6 a pound. To my knowledge you can only buy it through a commercial food service and it is a fabulous cheese. They say they mix it with a little grated provolone, but I have not. 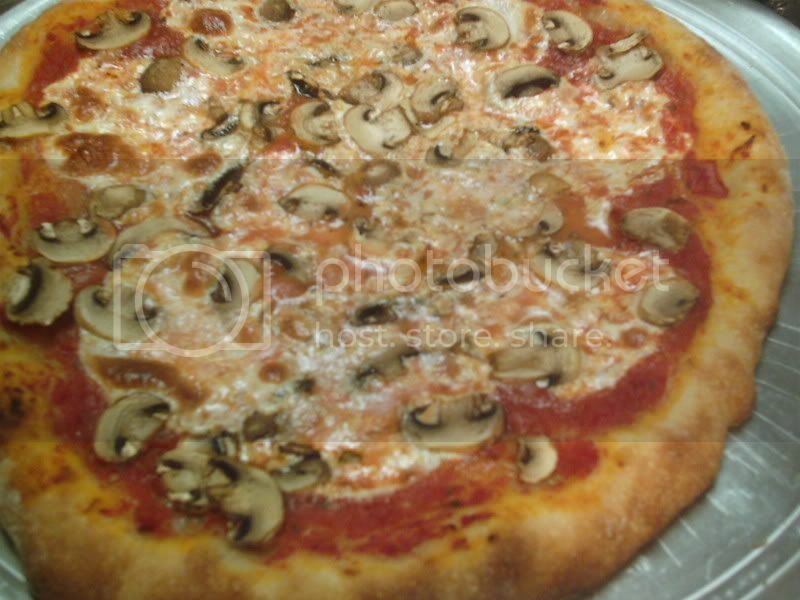 My pizzeria shared with me the importance of using part skim mozzarella cheese. They said it has more moisture in it and that makes the cheese melt more freely than whole milk mozzarella. Another very tasty spice to put into your sauce (in addition to garlic, oregano, basil, sugar, salt and pepper) is fennel. Several of the pizza chef's I've corresponded with say they use it. I did and it gave the sauce that little flavor that made it taste just like a delicious NY pizza. Note, some chefs only use basil and some only oregano. Some don't use pepper. Others use only red pepper, not black. I just needed to find the recipe for the sauce that suited my taste. I bought the stone that goes into your gas BBQ. It was about $80 if I remember correctly. I fire up the BBQ on high as I begin to assemble my pizza. I put the dough, after shaping it, onto a pizza screen that I bought from our local restaurant supply company (only a few dollars). I know Williams-Sonoma sells it, but you can Froogle it and find it cheaper. Then when assembled I put the screen in the BBQ on the stone, close the lid and lower the heat down to medium. The use of the BBQ to bake the pizza was an incredible find. Just about 3 minutes later the pizza is perfect. Key to a great crust is to let it sit in a platic bag coated with olive oil in the refrigerator for 3-4 days. It makes a significant difference. You can use either a basic french dough recipe, or add some sourdough starter to the dough and it tastes even better. One basic french bread recipe will make several pizza's depending on the size of the pizza (i.e. three to four 12inch pizzas). Also, the BBQ fires up to over 900 degrees, which is what you really need to bake an amazing pizza. My home oven only goes to 500, and until I bought the BBQ stone, I never could get the pizza quite right. I also didn't know before to let the dough develop flavor in the refrigerator. It helps the sauce too to sit in the refrigerator for 2-3 days. The chef's also taught me to drizzle a little olive oil over the cheese and sprinkle with oregano. This was another step that gave the pizza a much more authentic NY taste. Finally, there are several pizza chefs who you can correspond with who love to share information on their passion. It is a lot of fun to write them and learn about their techniques. There are also some good DVD's out there that I've enjoyed watching. They also gave me some additional insights around perspectives on flour and favorite millers as well. This is the recipe for crust and sauce that my mom has used as long as I can remember (I'm 40) and it's delicious. It makes a crust in between thick and thin - what I think of as 'homestyle'. I've used the dough for quick focaccia in a pinch, mix in some herbs and sun-dried tomatoes and sprinkle with caramelized onion and fresh parmesan. The sauce is tangy and not too thick. Hope you enjoy it! I'm planning to try the recipe above and see how they compare. I'd like to be able to make a thin, cracker type crust and might try to modify Mom's recipe to this effect. I'll keep you posted! Knead in bowl until smooth and elastic. Place in oiled bowl to rise. Let rise 1 hour in warm location. 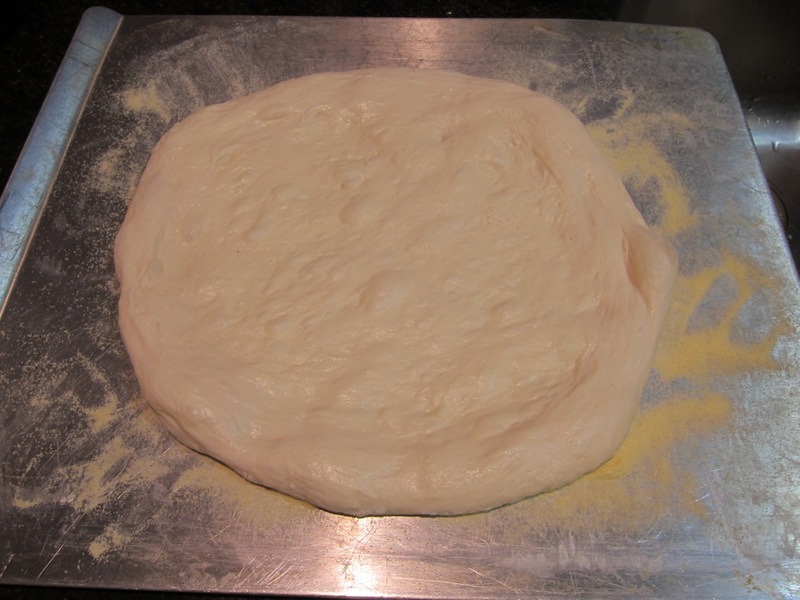 After dough has risen, roll in oil and spread on pizza pan. Bake 10 minutes at 400° F. Top with sauce, cheese, and desired toppings. Bake an additional 20 minutes or until cheese is bubbly and golden brown. Mix all ingredients in saucepan, and simmer 1 hour. Love the crust recipe and stuck completely to it the first two times, but after that it was a free for all. LOL My additions to the recipe were 1/4 c. of leftover sourdough starter to give it a little added taste beings we sometimes make the dough at the last minute, about 4 hours before we need it. We also like parmesan cheese in our crust, Italian seasoning and garlic salt. I add a T. each of the parmesan and Italian seasoning and replace half the salt with garlic salt. Just thought I would share. Made the dough last night and this afternoon let it warm up on the counter. This evening my 4 year old daughter and I piled cheese, sauce, olives, broccoli and vegi meatballs on top and then folded each one in half. I baked them on preheated pizza stones (used parchment paper to slide them in) and they came out crispy and chewy - perfect. Will make some more to freeze for our next pizza night. I made this again tonight, and it was the best ever so far. One tomato sauce/mozzarella pizza, and one pesto/mozzarella/sliced tomato pizza. Also, I substituted about 3/4 c. of whole wheat flour for the same amount of white, and liked it a lot. It's interesting how little whole wheat flour you need to add to give it a whole new taste and texture! And I added an extra half-teaspoon or so of yeast. Perfect! I did some mental math and realized each pizza cost me about $2.00 to make. How can you not love it? I am so hoping that this works and the link to some pictures can be clicked on. Nice pics. mattie...everything looks very tastey....nice job....have you tried the crushed S.M. tomatoes! I love them and so easy to spice up for a quick and easy very tastey sauce! Okay....In "Bread Baker's Apprentice, the Neopolitan dough calls for a choice of 'high-gluten', 'bread', or 'all purpose' flour. Using the "pain a l' ancienne" technique. In "American Pie", the Neopolitan dough calls for 'all purpose' flour using a slightly different technique. The "Neo-Neapolitan" at the top of the page calls for 'all purpose', and the "Neo-Neapolitan" in "American Pie" calls for 'high-gluten', or 'bread' flour. After making some thin neopolitans, that were bubbly and crisp(! )...a touch chewy...I've decided I'm not so crazy about really thin pizza. I'm trying for bubbly, crispy, not too thin, and soft on the inside....maybe not possible, but it's worth my effort to try. ..... are absolutely wonderful! I especially like the 2nd one, looks like I will be making pizza tonight after all! If you want a slightly chewy, thicker crust try the Sourdough version from American Pie. I'm thinking the eventual answer will be 'all-purpose' flour....and changing up the technique a little....I had good luck with the last pizza when I kneaded it a little when I pulled it from the refrigerator. ....still crusty and crisp, and it seemed to soften the inside noticeably. Hey! Do tell. Do tell. Is it this oven from Hammaker Schlemmer? Cheaper than a stand mixer. This one had bottled spaghetti sauce (Barilla Marinarra), Vadalia onions, fire roased red peppers, pepperroni and a 4-cheese blend of mozzarela, provolone, romano and parmesan. Delicious! BTW, I use a peel with cornmeal dusted parchment paper for all of my pizzas. That way I can load them up and safely get them to and from the oven. Wash a large amount (many cups) of fresh basil, shake or spin dry, then pick the good leaves, and place in a blender. Add just enough good quality olive oil to blend into a pesto-like paste. Pour into a dedicated ice cube tray, and freeze. Once well frozen, transfer to a freezer-weight zippered bag for storage. When making pizza dough, simply thaw as many cubes as needed to substitute for any olive oil in a recipe. Your dough will have a heavenly basil fragrance. The cubes are also a convenient way to have basil and olive oil ready for other recipes. That's a great idea. Thanks for posting it. I grow my own basel. At the end of the season, I harvest it and make pesto with basel, olive oil, garlic and pine nuts (but no cheese) and freeze it in ice cube trays, as dragonbones does. I then store the pesto cubes in Ziploc freezer bags for use during the rest of the year. BTW, my favorite sauce for pasta is one I had with tortelloni in Como, Italy in 1984: Mix 1 cup of Bolognese sauce with 3 T of pesto (1 or 2 frozen pesto cubes). Serve with grated cheese over pasta. Try it. It's totally amazing. Note: Add the pesto at the last minute. If you heat it too long, you lose the wonderful aromatic flavors of the basel. When I first had this sauce, I loved it so much I went back to the same restaurant for 3 consecutive nights to eat it. I use the freezer pesto for sauce, but since I aways seem to have fresh ricotta hanging around the house, I mix it with ricotta, additional olive oil, and some grated parmesan (no cooking required). Toss with the cooked pasta and a little pasta water. Yum. I don't know why it took me so long to try this! I think this dough recipe is perfection:) Thank you so much for posting this. I used 2 dough balls for pizza the first evening and let the remaining 2 sit in the refrigerator for 4 days. I've never had a pizza crust taste so flavorful with a chewy crispy texture. The leftover slice even held up well reheated the next day. Amazing! This is such a great recipe! Best pizza I've ever made!! I'm making my second batch today! My 1st pizza using this pizza dough recipe. one. I just could not wait as I was very hungry! of a cup next pizza. My 2nd Pizza truned out a lot better then my 1st try! Hi all.I have made this crust 4 times and it's turned out good every attempt.I have made it using flour I bought from my favorite pizza joint and I have made it using bread flour and AP flour.Doesn't seem to matter what flour I use as it's always GREAT pizza crust.Keep in mind please that I'd never made pizza dough till a week ago so this is my only formula and it's so good I probably won't use anything else.Using the AP flour I add Vital Wheat Gluten.I really do enjoy making this.Couple pics. why does the page come up blank when I try to print? Why can't I save it? that include things like oiling the crust before applying the sauce, pre-baking the crust (lightly), and putting juicy toppings like pineapple and tomatoes on top of the cheese. You can also squeeze excess juice out in advance, but usually the cheese protects the dough well enough. tomato paste to thicken it slightly. I didn't add the red wine vinegar/lemon juice. 9. Fresh basil can be washed, dried, and frozen in freezer bags as bare leaves. It turns dark and looks ugly shen done this way, but the flavor is great. Either put it into the sauce dd it to the top of the pizza after it is baked; the basil can't take the high heat of the oven. You can also wash and dry fresh basil, then pop it into a blender and add olive oil to make a paste. Pour this into ice cube trays and freeze, then transfer to freezer ziplock bags. Pull a couple cubes out in advance and let melt, then use this in the dough recipe or in the sauce or to brush onto the crust after the prebake and before adding toppings. It's similar to your method but you don't have the dark ugly appearance, and the finely textured paste can easily be incorporated into things (including the dough recipe itself for pizza or other breads if you wish). Your pizza is very nice. unfortunately, the only quick translator I use is google translator, to harry a little bit..
His englis is worst than mine, but is helpful.. I just said that I'm new in this forum and my english is so and so. But if you tell me what I have to do to help you, I'll do it..
My family enjoyed the pizza dough recipe last night! Thanks! I'm so encouraged to make more and better pizza! These past weeks, I've been playing with pizza quite a bit, and decided to give this crust a test run. It's a major hit! Best crust I've made to date, and that was two hours after mixing the dough! My step son said it tasted exactly like a pizza parlor pizza, which was a complement. I also made a neat discovery. I was out of parchment paper, which I usually place under the crust to make it easier getting it off the pizza stone. So I used aluminum foil, which I misted with olive oil and dusted with cornmeal, so it would not stick. It did not stick, but then I noticed the crust had a wonderful crispness to the bottom, something I had wanted, but gave up on. It resembled Pizza Huts Pan Crust, one of my favorites. I already have my preferences as to sauce cheese etc, but the crust is the thing I was not quite satisfied with. I followed the directions exactly, and now next batch, I'm gonna try increasing the honey by 2 tablespoons, and maybe double the yeast to compensate. I've read that adding sugar slows down the yeast. I am going for a slightly sweeter crust, like Papa Johns hand tossed crust. But, if it does not work out, I'm very pleased with this tried and true recipe. TFL pulls through again, thanks! I notice all the NY Style Pizza joints where I live make garlic rolls out of their pizza dough. They all are pretty similar except the difference in the garlic topping, which varies from one place to the other. Does anyone here know how to transform your pizza dough into garlic rolls? i am planning to try this recipe, maybe next time. i haven't made too many pizzas totally on my own, as my hubby made pizzas professionally so i jus rely on him usually lol. although he likes my dough more than his so i'd make a big batch. not too long ago we bought a used gas pizza cooker and im thinking since it gets so marvelously hot, pretty much any dough is going to turn out great. not sure, but this is my theory lol. mix and knead till you have a smooth dough. you could leave it to rest for a little while if you like, but i just immediately separate into balls and leave them to rest a bit while i get on with everything else. Love all the ideas ; -) letting the dough sit for a few days made a nice improvement to the crust! I find that using 000 Flour improves my crispy thin crusts a great deal. I was suprised to not see anyone else mention it. Using cherry tomatoes , halved, works really nicely as well. 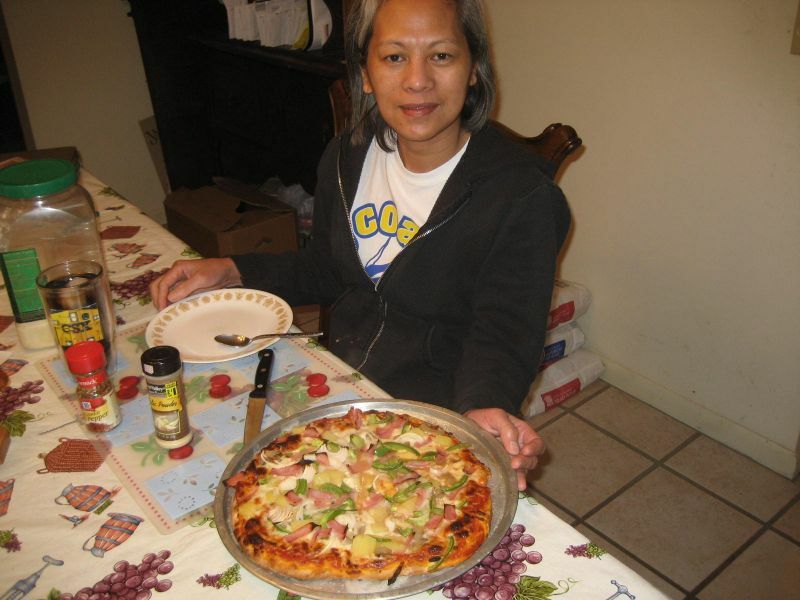 They have a lower water content than larger tomatoes so they cook down fast and well, with out making the pizza soggy. Basil in frozen cubes is great, but oregano can be treated the same way as well, so you have "fresh" year round. I even keep the sauce frozen in cubes so I can just pull out a few cubes to defrost. When I make sauce I use what I need that night, and then freeze the rest and bag it, the same as the basil and oregano. I am going to try the freezing of the dough balls and see if I like the results. That way Iwould pretty much have 'Frozen Pizza', homemade. Add toppings and bake! Will try it out one of these days but thanks for posting this! - Apply the base tomato sauce, then pre-bake in a maxed out oven for 4 minutes, this will give a nice rise and you'll end up with a half-baked crust that's no longer floppy. - Put on the rest of the toppings, when using mushrooms or bell peppers, sautee them briefly first. 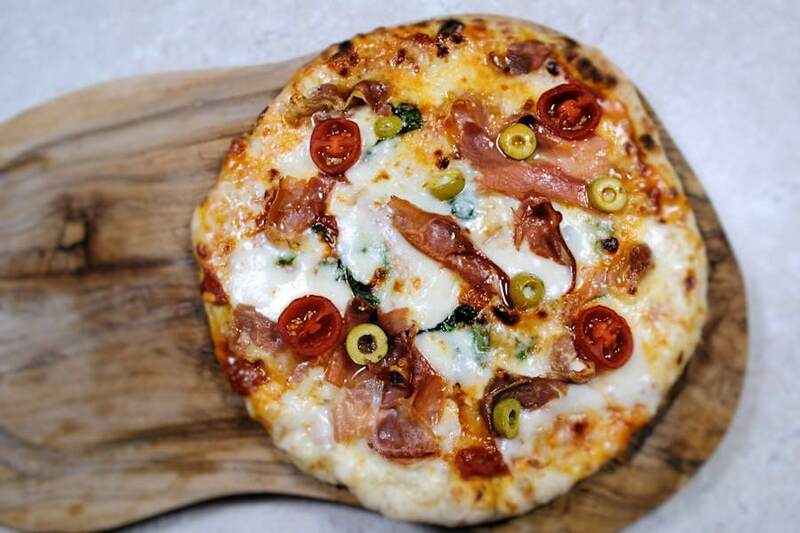 - Put the pizza on a wire rack in your oven so air can reach the underside of the dough and bake off for 6-7 minutes in a very hot oven, using air circulation. The result will be a thin, super crisp crust that doesn't turn soggy even when using relatively wet toppings and after sitting on a plate for a couple of minutes. Floyd - you're the best. Just finished the thread (took a while), and gained a whole lot of confidence. To the grill we go. Thanks to all for the exchange. I'm a relative newcomer to the bread baking world. I tried back in the early 90s and baked a lot of tasty bricks with my brand new KA mixer. I tried again last year and actually made a few loaves with recipes from this site that were quite tasty. Then I fried my KA. I've been doing some no knead breads for awhile. Santa brought me a Bosch and I've been baking daily since. The grocery store near me sells balls of fresh pizza dough in their bakery dept. I grew up in NY and seriously can not buy a decent pizza in South Central FL. I have to drive 20 miles to the next town and the pizza is meh. Last spring I bought Saltillo tiles and lined both racks in my over. I heat it to 525 and have been able to make some amazing pies with store bought dough. I tried making this dough a little while ago. I assembled all of the ingredients and got them all mixed. It seemed REALLY wet! I kept coming back to the screen to make sure I followed the recipe correctly. I added some more bread flour (about a cup) to the four cups of AP plus one bread that I used. Then it hit me. I thought I filled a pint container but it was a quart. I used three cups of water instead of two. It's very, very sticky. Since I like a cracker crisp kind of crust, I'm hoping that if I flour my hands well, I'll be able to form a decent crust on a sheet of parchment paper. I've been using a flat cookie sheet for transferring to the hot tiles for some time now and it has worked great! You almost got the sauce right. You have to cook it though. And let it stand. I am focused on the sauce. I have seen so many dud-sauces on the web, but yours is close. As for dough, I prefer whole wheat French bread to dough. 680 g water - 10 g yeast - 25 g kosher salt - 910 g AP flour - dough whisk all together and let rise for 2 hours, lightly covered. Refrigerate for up to 2 weeks (will develop a better flavor after 2 to 3 days and in easier to work with when cold). I cook all my pizzas free form now. I start on parchment dusted with cornmeal / polenta, then slide the parchment out directly on stones after the first 10-12 minutes at 450 deg. F. I preheat the stones and oven to 500 degrees and drop down to 450 after inserting the pie. This gives my stones enough latent heat to make a nice golden brown crust under the pie. Some shots of pie. Pie Pixels? The pizza looks super yum. Nothing better than home made pizza dough with gorgeous sauce, veggies, and herbs! I enjoyed reading this thread! I just bought two pieces of steel to replace my baking stone as I am experimenting with getting a great crust in my oven. It was cheap for the steel too! Around $30 for a 14" x 16" piece of metal. I looked on Amazon and a comparative one would be almost $100 ( https://www.amazon.com/Dough-Joe%C2%AE-Baking-Sheet---Emperor-trade/dp/B00LBKWSGW/ref=sr_1_sc_1?ie=UTF8&qid=1468597750&sr=8-1-spell&keywords=piza+stee... ). I thought others might be interested in doing this also. So if you want a baking steel, the fellow's name is Keith and he's located in Chambersburg, PA. I am looking forward to the next pizza baking day! I used this crust to make the tarte flambee from Bread. It came out great!